In Sacred Tradition in the New Testament, Stanley Porter takes an extended look at the use of Israel’s Scriptures in the writings of the New Testament (NT). It’s clear that the Old Testament (OT) was crucially significant for the NT’s authors. But even if that’s agreed upon, and despite the spilling of much literal ink and the shedding of much metaphorical blood, legitimate questions remain. What led the writers of the NT to interpret the OT in the ways they did? How should we determine when a passage from the OT is being used in the NT, especially if the reference is indirect or subtle? These are the kinds of questions that Porter, a professor at McMaster Divinity College, seeks to explore. Porter develops a number of proposals in Sacred Tradition in the New Testament. One of them is that the study of the OT’s use in the NT should shift away from the strict investigation of individual OT verses and onto broader themes, concepts and figures (p.49). In the introduction, he writes, “My approach to the use of sacred tradition tries to find more significant passages or themes within the OT and explore their use in the NT” (p.x). By sacred tradition, it should be noted that Porter basically means the OT, along with the Dead Sea Scrolls and some Hellenistic texts (p.3). Before he begins tracing the NT development of OT themes and figures, though, Porter first attempts to bring greater methodological precision and clarity to the conversation (p.2). In his discussion, Porter begins with the most obvious category of OT usage, “quotation,” and works from there to more indirect terms like “allusion” and “echo.” One would think that direct quotations would be easy to recognize, and in most cases they are. But how should a direct quotation be distinguished from other forms of scriptural citation? Does a direct quotation require an explicit introductory formula like “It is written” in order to count? If so, then what should we do with verses like Phil. 1:19 where an OT passage certainly seem to be quoted despite the absence of an introductory formula? There are also NT passages like Gal. 4:22 where an introductory formula is present but an allusion, rather than a direct quotation, follows it. Defining the relevant terms turns out to be harder than it looks. Porter separates the broad category of quotation into two subcategories: formulaic quotations (which have introductory formulas) and direct quotations (which lack them) (pp.33-34). Porter also constructs a new category, termed “paraphrase,” which differs from both formulaic and direct quotations. He describes a paraphrase as being “an intentional and specific invoking of a definable passage, even if it is made in other words and in another form” (p.36). It seems to me that the disagreement between Porter and Hays regarding the proper meaning of echo might come down to the fact that Hays seems at times to use “echo” both as a kind of reference and as a description of how OT meanings inform the dynamics of NT passages, while Porter doesn’t. That at least seems possible given Hays’ language regarding “how scriptural echoes lend resonant overtones to Paul’s prose” in Echoes of Scripture (p.21). I could be wrong, though. Having discussed his methodological proposal, Porter spends the rest of the book using this framework to explore some of the fascinating ways in which themes, figures, and concepts from the OT are developed and used in the writings of the NT (p.47). These studies range from an examination of the OT titles ascribed to Jesus in the Gospel accounts (like Son of Man, Suffering Servant, and Messiah) to the theme of Passover in the Gospel of John and the importance in the writings of Paul and James of Abraham as an OT figure. He also includes an interesting chapter looking at the figure of Esau in Romans and Hebrews penned by Bryan Dyer, one of Porter’s colleagues. In order to see how his proposal works out in more concrete terms, let’s now look at his study of Psalm 22 and the Passion of Jesus. However, “The second half of verse 21 is a turning point in the psalm” (p.157). There, the psalmist turns and declares, “From the horns of the wild oxen you have rescued me” (NRSV). By Ps.22:29-31, the emphasis, Porter notes, is now “on the vindication or exaltation of the sufferer and of God” (p.157). Looking at the psalm as a whole, he explains that it, like many other psalms of lament, shows a dramatic “movement from deep despair in the opening verses to overwhelming praises of deliverance by the end” (p.158). The question of whether the original hearers of Matthew and Mark would have understood Jesus’ cry on the cross in this way, however, still remains. Porter cites the words of Joel Marcus in The Way of the Lord, “No matter what it meant in the original, Ps. 22 was often interpreted in later Judaism as a description of eschatological events, including resurrection” (p.180). Porter thinks that the Qumran writings and the Jewish Targum of Ps. 22. provide additional support (pp.171-172). So, where does this vindication of Jesus appear in the Gospel? Of course, Porter understands the resurrection to be Jesus’ ultimate vindication, even in Mark, where “the resurrection is not explicit” (p.173). 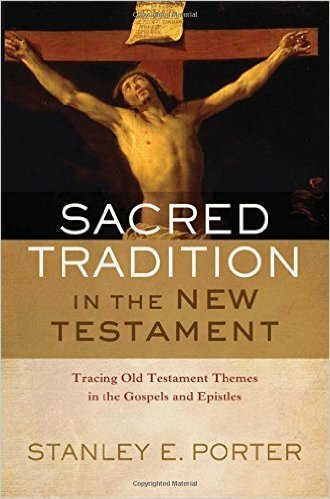 Sacred Tradition in the New Testament is full of detailed analysis of both the Old and New Testaments, and Porter has carried his investigation out with impressive rigor. He works hard to sensitively define his terms and avoid linguistic confusion, and other NT scholars would do well to imitate him in this respect. That being said, I’m still not sure about the usefulness of Porter’s firm separation of allusion and echo into separate categories. It still seems plausible to me that echo might be better understood as a general, more abstract kind of an allusion. I wonder, for example, how many passages an allusion can invoke before Porter would identify it as an echo, or how he would consider citations that both reference specific OT passages and also seem to evoke wider themes. I found Porter’s work to be refreshingly constructive and full of interesting ideas. This book is not merely another study tracing the OT’s usage in the NT, it’s also an exploration of how to do that effectively. Even for those who struggle to accept all of Porter’s proposals, they will be better for having grappled with the questions raised by him. From my perspective, Porter’s chapter dealing with methodology alone is worth the price of the book. Hopefully, this work will help NT scholars break through the mud of terminological confusion and onto the firmer ground of real dialogue, because it’s a fascinating topic. *Disclosure: I received this book free from Baker Academic Publishing for review purposes. The opinions I have expressed are my own, and I was not required to write a positive review. This entry was posted in Book Reviews and tagged Allusions, Book Reviews, Bryan Dyer, Echoes, Intertextuality, New Testament, Old Testament, Stanley Porter, theology by joecrow91. Bookmark the permalink.